The FOTOCAT Project (Spain) and CAELESTIA (Belgium) are pleased to announce the release of their joint book. 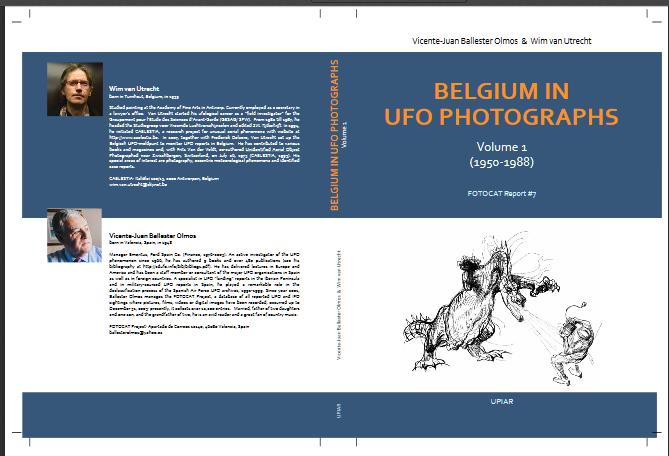 Belgium in UFO Photographs – Volume 1 is a research book that makes no concessions to literature. It is a scientifically oriented inquiry into a collection of supposed UFO pictures taken in Belgium in the period from 1950 to 1988. But the reader will certainly find more than descriptions of UFO sightings and detailed analyses of UFO images. For instance, the included catalog not only has numerous examples of how normal folks can be deceived by common phenomena, it also reveals the dubious background against which some photographs that received worldwide endorsement made their way into UFO history. The book is a documented history of four decades’ worth of UFO incidents that involved witnesses who provided photographic evidence (be that negatives, prints, slides, films, or videotapes), on top of their own testimony. The authors have investigated every event weighing the evidence for real anomalies occurring in our atmosphere. Though only a small country in Central Europe, Belgium’s rich UFO patrimony serves as a representative sample of UFO phenomenology worldwide. We thank our dear friend and UAPSG-GEFAI member Mr. Vicente-Juan Ballester Olmos for sharing with us this important information.